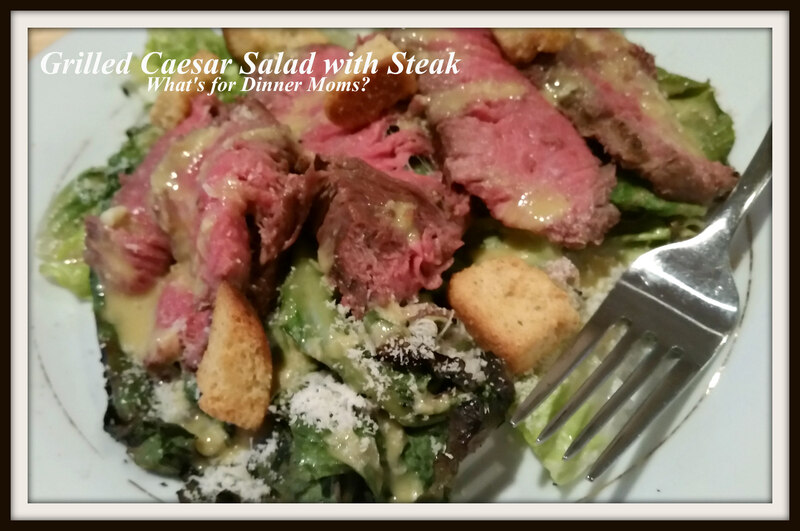 Grilled Romaine Caesar Salad with Steak – What's for Dinner Moms? This was a super simple meal on a busy night. When I first mentioned what I wanted to make for dinner I got the frown from my entire family. They thought we were grilling each individual lettuce leaf. No! You grill the Romaine hearts whole. It takes 2-3 minutes and is so easy and add a new flavor to the salad. 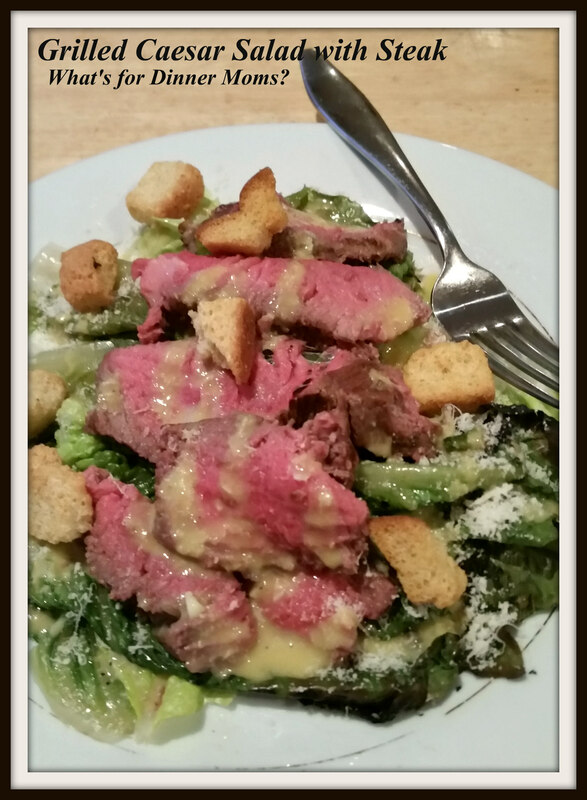 The best part of the meal was making the Caesar salad dressing with my daughter. I used anchovy fillets. You can use anchovy paste or leave them out entirely if you wish although you will need to replace the saltiness with a bit of extra salt. My daughter was shocked that the dressing was yellowish. She began to question what was really in the jars of Caesar dressing and how it is made! Score mom! While grill is preheating mix 1/2 cup olive oil, egg yolks, 1/3 cup Parmesan cheese, lemon juice, anchovy fillets, garlic, Dijon mustard, salt and pepper in a bowl until well blended. Taste and adjust spices to your liking. Cook steak on grill seasoned with salt and black pepper. Once they are done to your liking remove from grill and allow to rest 5 minutes before slicing. While steak is resting oil grill well with paper towels and tongs to avoid getting burnt. Lay dried Romaine hearts on grill. Turning over after 1 minute. If heat is uneven make sure all hearts get a bit of time on hotter area to get nice char marks. Remove from grill. To assemble salad: Cut bottoms of Romaine hearts and lay salad greens on plate. Lay steak slices over the greens. Sprinkle with extra Parmesan cheese and croutons. Drizzle salad dressing over the top and serve with extra dressing on the table to use as needed. I love grilled romaine! The salad looks delicious. Thank you! We have never tried it before but I can’t wait to try grilling other salad too! Not only does this look great but it reminded me of Erma Bombeck writing about teaching her child to make Caesar salad! Lol. Thank you! I loved Erma Bombeck. I need to see if I have any of my mom’s old books and reread them. Two of my favorites! Great idea! This looks amazing. That steak is cooked perfectly. I’d love to have this for lunch right now actually. . .